I love to cook. One of my favorite things to do is to cuddle up with a cup of coffee (or glass of wine) and read through cookbooks looking for inspiration. As much as I love to read recipes, my family teases me all the time about how I don’t FOLLOW recipes. They’re right. 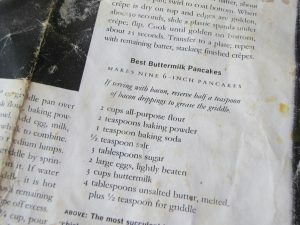 With a few exceptions like the recipe I use for Buttermilk Pancakes. I wish I could remember where I copied it from. I found this recipe about 20 years ago, made a copy of it and have not deviated from this recipe since day one. This is, hands-down, my favorite buttermilk pancake recipe. This recipe makes a LOT of pancakes. It’s written so that it makes nine 6-inch pancakes. Who makes 6-inch pancakes? Not me. Especially when I’m making them for kids. So I’d say that it makes more like 14 or 15 three to four-inch pancakes. I do have a small confession to make: I DO change this recipe up a little bit . . . sometimes I add blueberries. 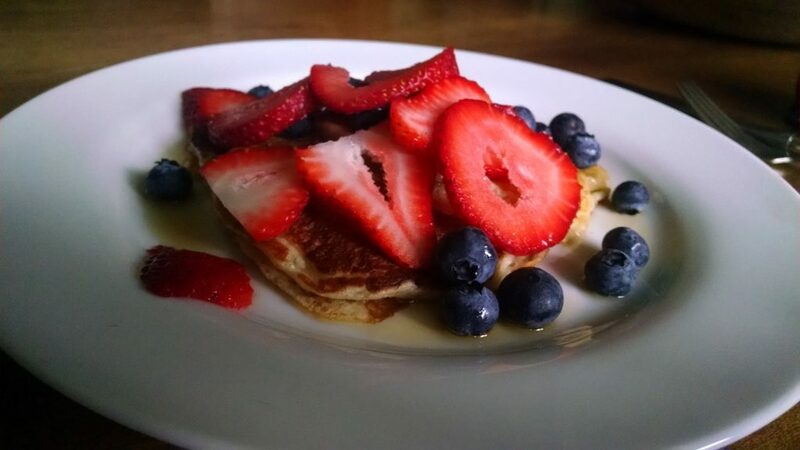 Most recently we ate them topped with fresh strawberries, blueberries and maple syrup. Just mix together the dry ingredients. In a separate bowl, whisk together the wet ingredients. Then fold the wet into the dry. The secret is 1) don’t overmix the batter and 2) let the batter rest for five to ten minutes. Here’s the recipe in case you want to print it out for yourself. 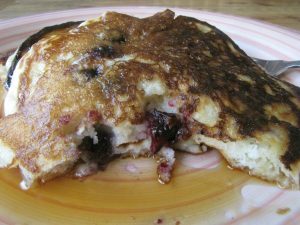 Light, fluffy buttermilk pancake recipe. In a large bowl, stir together the flour, baking powder, soda, salt and sugar. In a separate bowl, whisk together the eggs, buttermilk and melted butter. Don't overmix. A few lumps in the batter is fine. Heat a non-stick griddle, skillet or cast iron pan. Add about half a teaspoon to the pan or griddle until it melts and begins to bubble. You can use a half cup measuring cup to drop the pancakes onto the griddle - experiment to make the pancakes a size that's just right for your family. Cook until you see bubbles appear, then flip and cook until golden brown.